Arakwal National Park is an important part of the heritage of the local aboriginal Arakwal people that lend it their name. It is a natural haven to escape the bustling town for a few hours of quiet amidst nature. 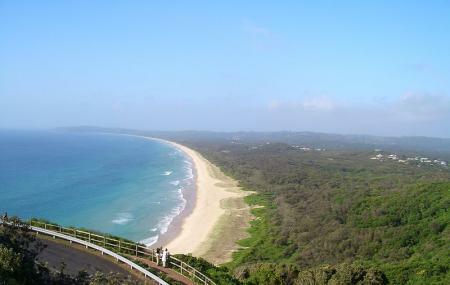 The Park includes the Tallow Beach, which is perfect for surfing and swimming. The Arkawal National Park is also home to several endangered species of plant and is a pit stop for migratory animals. During the migratory season one can watch the humpback whales as they make their annual journey. The Arakwal National Park is located 2.3 km from Byron Bay town center and the best way to approach it is from the Cosy Corner car park and walking the rest of the way. Nature lovers will delight in the lush greenery around them and water-babies can enjoy the beach. Take care not to damage the flora and fauna in the park. Wear a hat, sunglasses and sunscreen. Bring swimwear and towels if you plan to use the beach or go swimming. Please note that Tallow Beach is unpatrolled and care should be taken accordingly. How popular is Arakwal National Park? People normally club together Surfing At Tallow Beach and Hammer And Hand Byron Bay Jewellery And Metal Collective Gallery while planning their visit to Arakwal National Park. Beautiful waves. And we were the only ones on the beach!